Fayrouz L’Original Expression Show is designed to give young undergraduates with unique creative abilities a platform to showcase their original works for a chance to win amazing prizes and opportunities. Do you have an active matriculation number or call-up number? Are you bursting at the seams with creative ideas? Do you have an urgent need to express your creativity? Then you need to shoot pictures that speak a million words (Photographer), have the looks and walk to set the runway on fire (Model), exhibit your flair for creating unconventional fashion designs (Fashion Designer), and create art with a blush, scissors and comb (Hair and Make-Up Artist). Are you an Original Team with these 4 personalities? 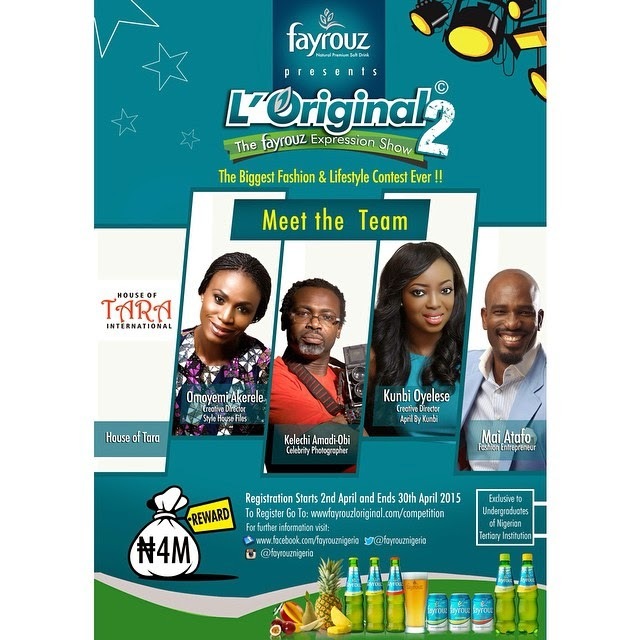 Then come show your stuff on The Fayrouz L’Original Expression Show; Nigeria’s biggest Fashion and Lifestyle competition. Create a portfolio by filing out the form provided. Registration starts on the 1st of April and ends on the 30th of April 2015.